Come see what all the splash is about when Waterworld Central, Australia’s first portable water theme park, returns this Summer! 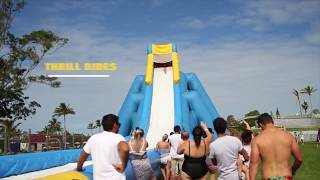 Join all the fun at Waterworld Central with giant inflatable pools and slides to splash and play around in. Try fun activities like the giant twin slides of the Dragon Pool or bouncing around under the palm trees the Shark World. If you’re looking to relax, just splash and have a good time in their Wading Pool. For those that dare to take the Dino Challenge, plummet down the long drop of their Colossal Dino Slide! If that’s still not enough, try walking on water in the Waterworld Zorb Balls!